I’m a people person. I know that is a cliché, but it is true. I’m a major fan of technology as well; social media is amazing. I’ve never been more connected to people before, and my friends are all over the world; it is a great time to be alive. Yet with all that said, I feel passionately about people meetingeach other face-to-face. Sitting down with them and sharing the beverage of your choice, working with them on a common project, brainstorming solutions, and giving them your undivided attention when they are trying to explain something that they know a lot about. In the skeptic world I think this interaction happens at conferences and meetings; I think of it as the first step toward activism. The Monterey County Skeptics held their first SkeptiCamp in Seaside, California, on the first Saturday of 2015. We are a social group that is run completely through Meetup.com and Facebook. We do have a blog, but it has very few followers and rarely posts updates. We do not collect dues; our meetings usually involve eating and talking about world events, books, our cats, podcasts, and for some strange reason North Korea. There is nothing formal about us, and our bimonthly meetup hosts about twelve people. We are just a typical skeptic meetup. At the same time that we were forming MCS, a member of the Denver skeptics, Reed Esau, came up with the idea that groups could throw a one-day, usually free, mini lecture event, called a SkeptiCamp, and the speakers are . . . drumroll . . . themselves. What a terrific idea. For some motivated skeptic groups this idea really took off. Esau was himself inspired by Daniel Loxton’s essay “Where Do We Go from Here?” and also by attending The Amazing Meeting in 2007. 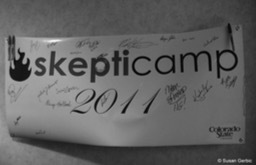 Since the first SkeptiCamp held in Denver, Colorado, in 2007, they have happened all over the world. The first Camp held outside North America was in Scotland by the Edinburgh Skeptics in 2009. The first non-English SkeptiCamp was held in Madrid, Spain, in 2012. Camps develop their own unique style and try out new techniques. For example, the Australian skeptics have a cupcake contest at their event each year. The Atlanta skeptics in 2014 tested a new style of presentation where the slides for each presentation were on a timer and moved on their own, which kept the lecture on time and hopping. The Chicago skeptics raffle off a plush narwhal to raise funds. As more SkeptiCamps happen, the creativity and uniqueness amplifies. This October, Esau tells me, the hundredth SkeptiCamp will happen in Brisbane, Australia, an event I’m happy to say I will be attending. Lately I’ve noticed a trend where SkeptiCamps are held the day before a larger conference. This encourages people to show up early and gives more attendees a chance to participate, making the whole conference experience last longer. Monterey County Skeptics finally joined the rest of the skeptic world and had its first Camp on the first Saturday of 2015. This was a very important step for our group. Because this was our first organized event, we thought we would aim for an attendance of thirty people, completely free, and host it in Seaside at the Peace Center that offered us the room for a low donation. Deborah Warken, Kathy McKenzie, and I exchanged a few emails and with very little effort we managed to pull it together. We did not want to publish a website for the event, so I suggested Lanyrd, which is a free conference website that gives people the ability to create conference events and track speakers, and it acts as a repository for all videos, blog posts, photos, and anything else associated with the event. We were even able to set up a “call for speakers” that we posted all over our local social media sites. We attracted Kyle Polich from the Data Skeptic Podcast who drove from Los Angeles (about a six-hour drive) and two other speakers, Jay Diamond (Reason 4 Reason) and Nitin Tomar from the San Jose area (an hour drive). All other speakers—Glenn Church, Kathy McKenzie, Mark Folsom, and me—were local to the area. Lanyrd made it super simple to manage our SkeptiCamp. The day of the event arrived. Several of the members brought fruit and pastries. I purchased name-tags for the attendees and fumbled with my computer the day before and made professional-looking name tags for the eight speakers. Professional mentalist Mark Edward was our emcee throughout the day; in between each speaker he performed some feat of mentalism, showing us the tricks of the psychics. We had some video and audio problems, but mostly we managed. One thing I’m really proud of is that I ordered a large 16×20 poster with our logo for the podium. I think that was a really nice touch because there were a lot of photos and videos taken that day. We brought in magazines and books to distribute for free; one man read about us in the paper and brought his old Skeptic magazines to give away. We collected donations for the building, and ran about forty-five minutes long. But we started out with forty to forty-five attendees and ended the six-hour day with thirty-five. I call that a win. We all had a great time; lots of people attended who had never heard of skepticism as anything other than a way of thinking. They didn’t know there was a community. We had emails after the event, and our next meetup had twenty-two people attend—a previously unheard of number. We bonded, met new people, showed the public that we exist, and found that there are a lot more skeptics than we realized. I encourage everyone reading this who thinks they are alone in their area to be skeptical. If you aren’t comfortable trying to start with a SkeptiCamp, you might want to start with a Skeptics in the Pub event. Advertising is free on a lot of local media; Facebook and Twitter can help a lot also. Try to reach out to local news media; you are doing them a favor. They have deadlines to fulfill and a story about critical thinkers might just be what they are looking for. I remember listening to a recent podcast and the host was talking about how popular their skeptic events are now, but in the beginning it was just two people who hadn’t known each other at first sitting in a pub sharing a drink month after month. Eventually people started joining them and they grew into something amazing. We need face-to-face interactions. Some of our people tell me that our meetups are where they can be themselves; they don’t have to guard their language, and no subject is taboo. Often they tell me that they are uncomfortable having these conversations at home and never have them at work. This is their chance to meet like-minded people with whom they can discuss all kinds of topics without looking over their shoulder wondering who might be listening. At the end of our SkeptiCamp we were tired, but a happy tired, and we didn’t have to even discuss it. It was obvious that we would be doing this again the next year, the first Saturday of the year. We opened up a Lanyrd conference page for January 2, 2016, location to be determined. We are going to publicize the 2016 event better, find a larger location, and try to arrange for more food and much better recording. Please don’t overthink it; just reach out and try to make contact with one other local person. You might be sitting alone at a pub for an hour, but be persistent. I assure you, you are not the only skeptic in your community.